An artist's multiple with essays by Lucy R. Lippard and Andrew C. Revkin is available upon request. 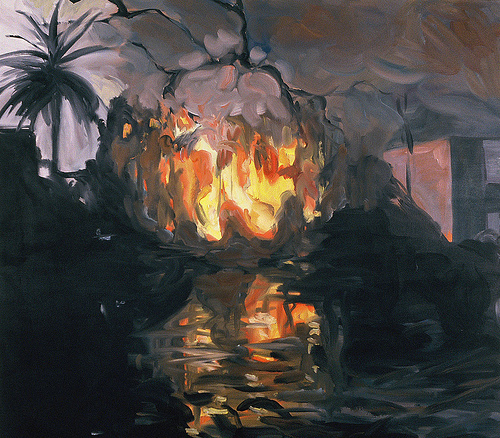 Washington - "Strange Weather," an exhibition of paintings by Joy Garnett depicting environmental and social catastrophes, will be on view by appointment from Jan.15 through April 30 at the National Academies' Keck Center, 500 Fifth St., N.W., Washington, D.C. It will then be placed on public view from May 5 through July 30 at the National Academy of Sciences' headquarters, located at 2100 C St., N.W., Washington, D.C.
Joy Garnett gathers photographs of man-made and natural disasters from the Internet and renders the images as richly textured oil paintings. In the process, she locates tensions between the visceral power of paint and the fleeting nature of images in the mass media, addressing the evolving role of art in an information-saturated society. Curated for the National Academy of Sciences, the exhibition focuses on the aftermath of Hurricane Katrina. In Strange Weather, Garnett takes widely distributed news images of a devastated New Orleans and recasts them as paintings in which geological, political, and sociological weather are inextricably intertwined. Based in New York City, Joy Garnett studied painting at the École Nationale Supérieure des Beaux-Arts in Paris and received her MFA from the City College of New York. Her paintings were recently exhibited in "Image War," organized by the Whitney Museum of American Art , New York City, and "Run for Your Lives!" at DiverseWorks, Houston. In 2004, she received a grant from the Anonymous Was a Woman Foundation. In 2000, she received a commission from the Wellcome Trust to participate along with her father, biochemist Merrill Garnett, in "N01se," a multi-site exhibition about information and transformation at Kettle's Yard, Cambridge, and the Wellcome Trust's Two10 Gallery, London. The exhibition was organized by artist Adam Lowe and historian of science Simon Schaffer. For more than 20 years, the Office of Exhibitions and Cultural Programs of the National Academy of Sciences has sponsored exhibitions, concerts, and other events that explore relationships among the arts and sciences.